The naming regime for Bridge Road's Mayday Hills range gets more and more abstruse with each passing release. 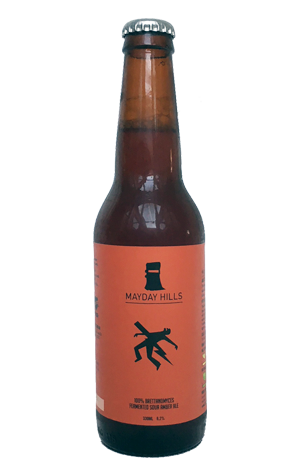 The past few have opted for images of the most unusual ingredient in the beer – raspberries, honey, elderflower – instead of words; here, we have a man being struck down by a lightning bolt. So, at risk of creating a situation akin to the time we took Hargreaves Hill founder Simon Walkenhorst at his word that a just-released IPA was called Melanie "because it's really melony" when, in fact, it was called something quite different, only to see it referred to as Melanie on rating websites, we're going with Death By Lightning. While uncertainty reigns over the name, we do know a little more about what's inside: an amber ale brewed with Munich malt from crafty NSW maltster Voyager, fermented with Bridge Road's house Brettanomyces strain in the brewery's foeder. The beer was then soured and refermented in stainless tanks, before a spot of dry-hopping with Galaxy. It's a combination of processes that's led to something of a beer in two parts. Once in your glass, it's best to leave it a while for some volatiles to dissipate and let the maltier side of the aroma come through, as that makes for a truer introduction to the flavours that await, a mixture of malty sweetness with a light acidity underpinning it like a pulpy OJ.